The indie-folk outfit will join the likes of Michael Kiwanuka, Daughter and Bear’s Den at Communion's intimate show. 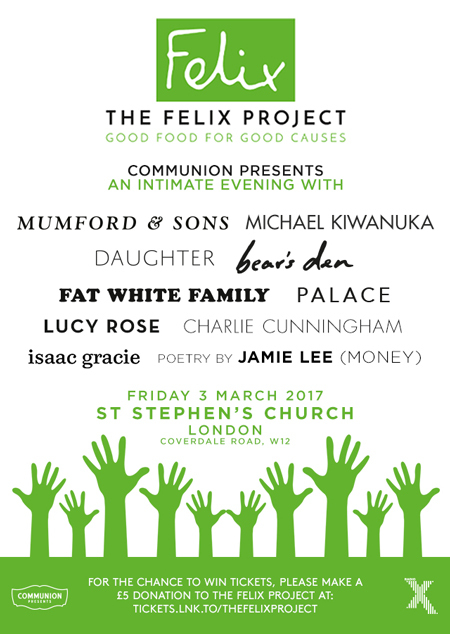 Communion have announced a very special charity concert for The Felix Project featuring Mumford And Sons, Michael Kiwanuka and more. The intimate event - which will take place at St. Stephen's Church in Shepherd's Bush on 3 March - will raise funds for the organisation which provides "good food for good causes". Also confirmed for the charity show are the likes of Daughter, Bear’s Den, Fat White Family, Palace, Lucy Rose, Charlie Cunningham, Isaac Gracie, and Money's Jamie Lee. 150 pairs of tickets will be available for the concert via a paid ballot, which can be entered from Friday 3-27 February 2017 for £5 each time. Find out more about The Felix Project here. Enter the £5 ballot for your chance to win tickets for the show here.